Recording Connection Master's student Taylor Crommie does K-Pop, Indie & The Grammy's! Master’s Recording Connection student, Taylor Crommie, has perfected the art of making things happen. Talk to Taylor and you’ll hear just how optimistic and inspired he is to learn, to help fellow artists with their work, and to broaden his horizons both musically and professionally. As if that wasn’t enough, Taylor’s also going strong with indie electro rock band Breakfast. The L.A. based group is acquiring a cult following fast, made even more cult-y by it’s release of David Lynch Twin Peaks inspired tracks and music videos, “Boris” and “Diane.” The tracks are garnering lots of interest and play, even appearing on quite a few notable blogs. Where it leads, only time will tell but we can tell you this much, Taylor’s making the most of the journey every single day. So what does Taylor say about getting involved in so many different genres, studios and facets of the business at once? 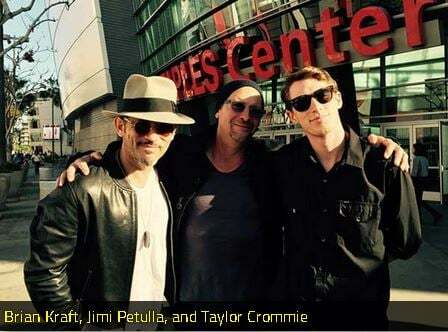 And just to top it all off, Taylor Crommie had the privilege of joining our very own Chief Executive Officer, Jimi Petulla and Chief Operating Officer, Brian Kraft backstage at the Grammy’s 2015 for a super-exclusive tech tour. Congrats Taylor! Keep on going strong!